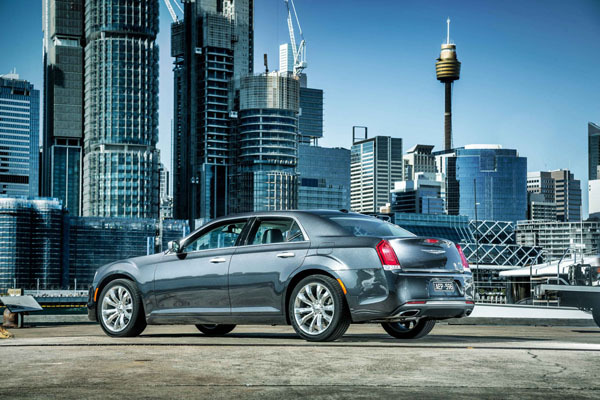 Chrysler has launched an upgrade to its second generation 300C sedan with a new front and rear fascia design and a number of improvements under the skin. The generation two model, launched in 2012, came with a smaller, more subdued grille that softened its appearance and took away some of its distinctiveness. The 2015 grille moves back in the previous direction being taller, with a honeycomb infill and the Chrysler wing badge in the centre, rather than at the top of the grille. There are also new LED foglamps and daytime running lights. In profile the characteristic broad shoulders and high beltline remain but with four new wheel designs in either 18 or 20-inch. Changes to the rear include a new fascia design and LED taillight. The 300C range has been trimmed from six to two with lack of demand seeing the previous 3.0-litre diesel engine dropped along with the entry-level Limited variants. The remaining models are the $49,000 300C and $54,000 300C Luxury. Both are powered by the same 3.6-litre Pentastar V6 petrol engine as before. It generates 210 kW, and 340 Nm of torque at 4300 rpm. It is mated with a TorqueFlite eight-speed automatic. Fuel consumption is rated at a reasonable 9.4 litres per 100 km on the combined cycle for the 300C and 9.7 L/100 km with the slightly heavier Luxury. We’ll take our own readings when we do our extended test. 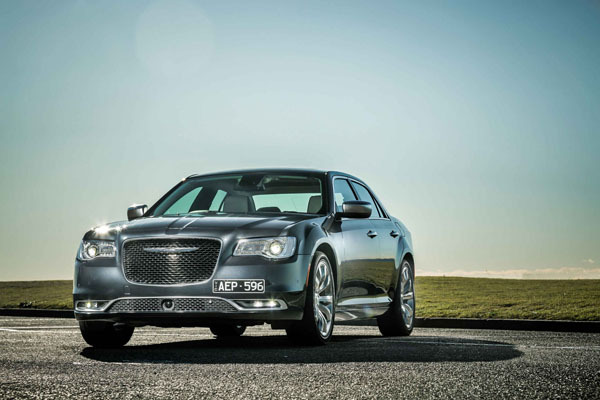 The 6.4-litre V8 300 SRT model is en route to Australia and is expected to be launched within the next two months. SRT stands for Sports & Racing Technology which gives a clue to what it’s all about. Below the surface there are a number of changes including a change from the previous hydraulic power steering system to an electric one. As expected the big Chrysler has plenty of legroom, headroom and shoulder space for four adults although the transmission tunnel does restrict the centre rear space and makes it awkward for a third adult. The boot is large and functionally shaped although there is a long stretch to reach the back. As well as Electronic Stability Control and Traction Control; standard safety features include ABS brakes with Brake Assist, Ready Alert Braking and Rain Brake Support. There are full-length curtain airbags, seat-mounted side thorax airbags, driver’s knee airbag. The 300C Luxury adds Adaptive Cruise Control Plus with Full Stop; Lane Departure Warning; Full-Speed Forward Collision Warning; Blind-Spot Monitoring; and Rear Cross-Path Detection. 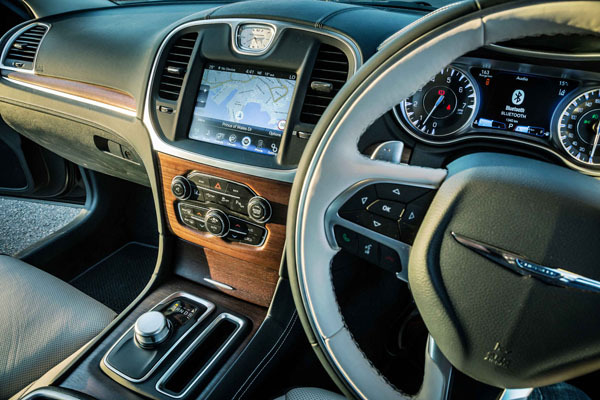 Other standard features in the 300C include 18-inch alloy wheels; perforated Nappa leather-trimmed upholstery; 8.4-inch Uconnect touchscreen; satellite navigation; dual-zone automatic temperature control; digital radio; heated and ventilated front seats; automatic headlights; powered front seats; and heated/cooled front cup holders. The Luxury gets 20-inch alloys; deep-quilted Nappa leather-trimmed interior; and Sport mode with steering-wheel paddles. Our relatively brief drive of the 300C Luxury took in the south and western Sydney suburbs interspersed with a detour through the Royal National Park. Despite its size it was easy to manoeuvre and park – the front and rear sensors and reversing camera really do earn their stripes in a car of these dimensions. It was on the motorway route from the north-west to Sydney Airport that the big Chrysler was in its element. It provides a smooth, quiet and relaxed ride. Just the thing for a long-distance trip, both day or night – our return journey was done at night with the adaptive Bi-Xenon high intensity providing excellent visibility. Back in the 1960s and ‘70s Australian sales were dominated by what were called the ‘Big Three’ – Holden, Ford Falcon and Chrysler Valiant. The Valiant left the scene in 1981 leaving the field to the other two. Now the position has been reversed with the imminent demise of the Falcon and Commodore leaving a big Chrysler by itself in the affordable large sedan segment. We reckon there’s still a market out there for big cruising sedans so Chrysler may well cash in.